Resugga Castle is an Iron Age Hillfort in Cornwall, England. Resugga Castle straddles the summit of Crow Hill, its main enclosure lying on the gentle SE slope bordering a steep scarp down to the St Stephens River close to its confluence with the River Fal. The site lies on Devonian slates in a hilly terrain deeply dissected by small rivers. It has excellent long-distance views over the surrounding countryside, especially to the west. As a result of its prominent position and good preservation this monument has attracted antiquarian interest since the early 19th century, but it has not been subject to any recorded excavation. The hillfort encloses a sub-circular area 70m by 60m, markedly flattened along its SE side where it follows the crest of a steep scarp down to the St Stephens River. Photographers notes: This site needs to be re-visited. On the day I was there I had very little time and could only manage a quick circuit and a couple of fly-overs. The slope on the far side is amazingly steep as you can see from the circuit video below. It would be worth getting permission to enter the field and explore it properly although most of the ditches are covered in scrub. Summary: Oval, complex, multiple enclosure hillfort straddling summit of Crow Hill, main enclosure lying on gentle SE-facing slope bordering very steep slope down to St Stephens River valley and close to its confluence with River Fal. On Devonian slates SW of Hensbarrow Downs granite mass, in hilly terrain deeply dissected by small rivers. Commanding views, especially to W. Outerwork of bank and ditch along top edge of slope to N. Surrounding slopes to SW and SE wooded. Sub-circular area 70m by 60m encloses c. 0.3ha, flattened along SE where follows crest of steep scarp to St Stephens River. Earth and rubble rampart, c. 2m high and 10m wide along NW, with terminals bordering entrance gap, and reduced to 0.5m high along to SE. Outer ditch c. 1m-1.5m deep, with rock-cut outer face. Recent dry-stone supporting wall also in parts of ditch outer face, notably S and W sectors. To NW outer enclosure has two sections of rampart c. 45m long, each parallel with, and 35m-40m from, main enclosure, and separated by entrance gap in line with that of main enclosure. Each to c. 2m high and 10m wide with outer ditch 1m-1.5m deep. Beyond these ditches, hollowed route-way formed by double bank and central ditch extends in straight line NW from enclosure entrance for c. 55m, continued beyond by single recent hedge bank extending line of N bank. Main enclosure entrance on NW opposing central entrance of outwork from which hollow-way runs NW. Outerwork never connected to main enclosure, the feature connecting on W is field bank. Interior formerly ploughed, now pasture. Ramparts tree covered. Well-preserved. On 1st Ed. OS map (1881). Undated. 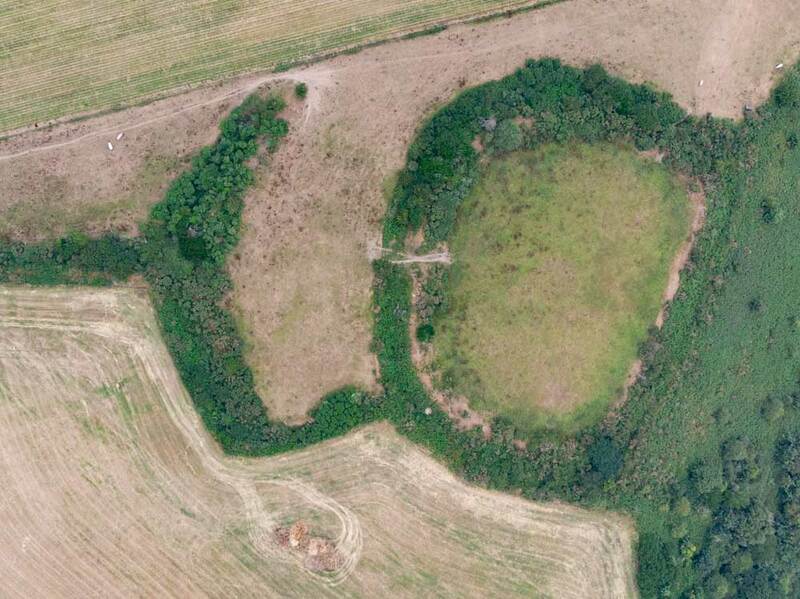 Airchaeology is a citizen science project set up to collect aerial video of interesting archaeological sites. There are no restrictions or criteria for submission and we encourage anyone who is interested to get in touch and get involved. This is a ‘citizen science’ project showcasing the most exciting archaeological sites in the world using aerial video and photography. If you would like to contribute your videos and photography, then please contact David here.